What It’s About: Ships begin disappearing in the Pacific. Slowly the authorities begin to suspect something more than natural activity is at play. When something comes ashore and destroys several buildings on remote Odo Island, an expedition is sent to discover what it is. What the expedition finds is an enormous prehistoric beast, made radioactive by American nuclear tests. When Gojira moves ashore, can a way be found to stop it? Why Watch It Today? : The United States dropped an atomic bomb on Hiroshima today in 1945. The choice of a Godzilla film on such a solemn occasion may seem flippant, but the film, in the original Japanese cut, is very much about the atomic bombs and later American atomic tests whose radiation killed sailors. Gojira is a monster and disaster movie, but it’s also about what path Japan should take in a nuclear world, a world that had taken quite a bit from Japan already by 1954. Then groundbreaking special FX work by Eiji Tsuburaya, Akira Ifukube’s score, Ishiro Honda’s deadly serious direction, and strong performances from Takashi Shimura (more known for Akira Kurosowa than Godzilla films), Akihiko Hirata and Akira Takarada make this film stand out from the genre it would create. Be sure to see it in the original Japanese version, and not the entertaining but heavily altered American release, Godzilla, King of the Monsters. 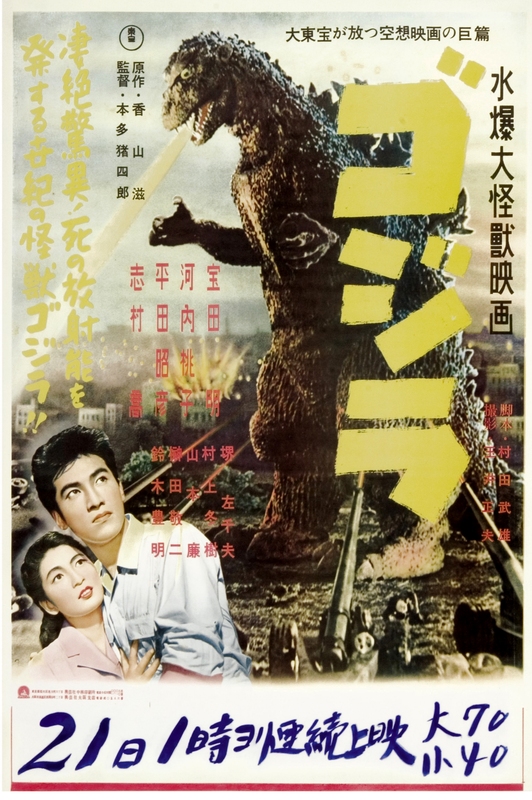 This entry was posted in Black and White, Disaster, Drama, Horror, Kaiju, Melodrama, Monster, Movie of the Day, Mystery, Sci-Fi, The Original and tagged Akihiko Hirata, Akira Ifukube, Akira Takarada, arranged marriage, atomic testing, divers, Eiji Tsuburaya, Godzilla, inventors, Ishiro Honda, Japan, love triangle, natives, paleontologists, radiation, radiation mutation, scientists, secret weapon, shipwrecks, Takashi Shimura, Toho, Tokyo, World War Two Veterans.